María is one of several women of the Zapotec ethnolinguistic group encountered every Sunday at the Tlacolula market, sitting on the pavement selling terra cotta pottery. The alfareras, as they’re known, hail from San Marcos Tlapazola, a village of about 2,500 residents, tucked away at the foothills of the Sierra Madre del Sur. They sell their red clay ceramics primarily in Tlacolula, in Oaxaca’s central valleys a 40 minute drive from the state capital. Their barro rojo can also be purchased in other marketplaces and craft stores throughout the state – comals and vessels used for cooking over either open flame or propane fueled stovetops; an assortment of pitchers and vases in addition to serving plates and related dinnerware; as well as purely decorative folk art including humanesque figures and masks. The daily routine of María and her sister-in-law Gloria is grueling. The financial rewards for them and most villagers are extremely modest. But these craftswomen carry on a skillful tradition dating back hundreds of years, using essentially the same tools of the trade and means of production as their forebears. To retrieve their raw material María and Gloria venture out on foot with their mule, occasionally with María’s son, or her brother in his pickup if he’s available. The hard, dry mud they mine is found a mile or so beyond the fields of the agriculture-based community. Digging it out from close to the base of the mountain is the first step in producing their fine pottery. At 7 am on a Friday morning after breakfast, the three of us head out in my truck, armed with a shovel, three empty grain sacks, a sturdy vinyl market bag, and a five foot long heavy iron crow bar called a barreta. María begins excavating, loosening up the clay. Gloria shovels it into one of the costales. After a while they switch jobs. I chip in and quickly break a sweat. They don’t. After the three sacks are filled we head to another quarry a few hundred yards away, where the women do the same, but this time collecting a smaller amount of a different class of clay that they’ll mix into a paint to give their finished pottery the terra cotta color. Back at home, after snacking on sandwiches of crusty rolls filled with fresh cheese and salsa washed down with mezcal, the women pick stones and roots from the clay before leaving it to soak in water. On a concrete floor in a sparsely furnished dark room, María kneads an earlier batch of softened clay which has already been put through a wood-framed fine metal grate to extract remaining impurities. While kneeling, she adds a little water and sand and creates a buttery consistency. She then begins to work her magic, transforming in excess of two pounds of clay into an exquisite vase. Hands raised to head level María pounds out the middle, creating a funnel shape. She then gradually extends it by rolling a piece of corn cob over it. Next she places a small round piece of hard plastic on top of a large heavy stone with a shallow depression in the middle. The hollow was created through decades of use by her mother and grandmother before her. She places the cone on the rock, then spins it into a rudimentary form using her two hands and nothing more. This is her wheel, a much more rudimentary tool than the peddle wheel of Mitla, the round wooden spinning disc of Atzompa, and the two plate system of San Bartolo Coyotepec of black pottery fame. A piece of hard gourd is used to smooth the vessel’s interior and to fashion the final exterior shape. A strip of soft leather facilitates the creation of a smooth finish to the neck. The base of the vase is perfectly round, narrowing near the middle, then extending out to its fine upper lip. It’s left to dry while María continues on others. Gloria is sitting close by. Using a well-worn jade-like stone gifted by her grandmother, she’s burnishing a small bowl she has removed from under a cloth covering several pieces. The polishing creates a natural glaze. A day earlier she had transformed the color on each piece from beige into the village’s signature terra cotta using the homemade paint derived from the other clay. Every piece must be left to dry before a subsequent production stage. Some alfareros in the state use above-ground brick and cement ovens. Others employ below-ground lined pits. Potter Manuel Reyes of Yanhuitlán constructed his twin kilns out of clay brick, lengths of re-enforced steel, and mud. But many women in San Marcos Tlapazola like María and Gloria, each and every firing day build a makeshift above-ground open-air oven made of old bed springs, pieces of rusted-through wheel barrow, bent bicycle tire rim, sections of otherwise unusable laminated metal, and broken pieces of pottery that have not survived a prior firing. For fuel, a cousin often sells the women a truckload of twigs, branches and rotted out logs for a few hundred pesos. Sometimes he brings dried agave leaves or flower stalk which have been left in the fields after the hearts or piñas have been harvested by others for use in making mezcal. María and Gloria also collect small branches and dried agave discard while walking nearby fields. They tie them to both sides of their mule to transport back to their homestead. Saturday is devoted to firing, provided there is no rain and not too much wind. María coordinates while Gloria divides her time between helping out and being in charge of other household chores including cooking meals as well as tortillas for both family consumption and sale. 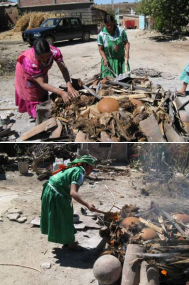 To prepare the temporary oven for igniting, María cuts agave leaves with a machete while Gloria pitches in by splitting logs and lengths of agave stalk with the barreta. With gingerly proficiency María begins placing the clay pieces. She directs Gloria as to how she wants it done. From decades of experience she knows how to achieve even firing and minimize breakage. Additional burnables are then placed on top of the barro. Hot ash from cooking is shoveled into crevices to facilitate incineration, while a couple of matches set to tumbleweed and cardboard ensure a quick light. The breeze fuels an initially fledgling fire, and within seconds the blaze is raging and smoke billowing. More branches and agave are tossed on with great care since multi-directional wind tunnels have been created. Gloria fully covers her head to ensure that spark does not ignite her hair. Each takes turns extricating herself from the swirling flames. Finally sheets of rusted metal are placed alongside and atop to control the entry of air being drawn to the inner portions of the enclosure. The flames subside after about 45 minutes. The area is left to cool while Gloria and María return to their workroom to continue fashioning more pieces for firing the following week. They later emerge to disassemble the makeshift kiln and remove the pottery, dusting off ash. María and Gloria wrap and box their merchandise in preparation for attending the Sunday Tlacolula market, along with the other female potters of San Marcos Tlapazola, Oaxaca. Alvin Starkman lives in the state capital where he operates Mezcal Educational Excursions of Oaxaca (http://www.mezcaleducationaltours.com).